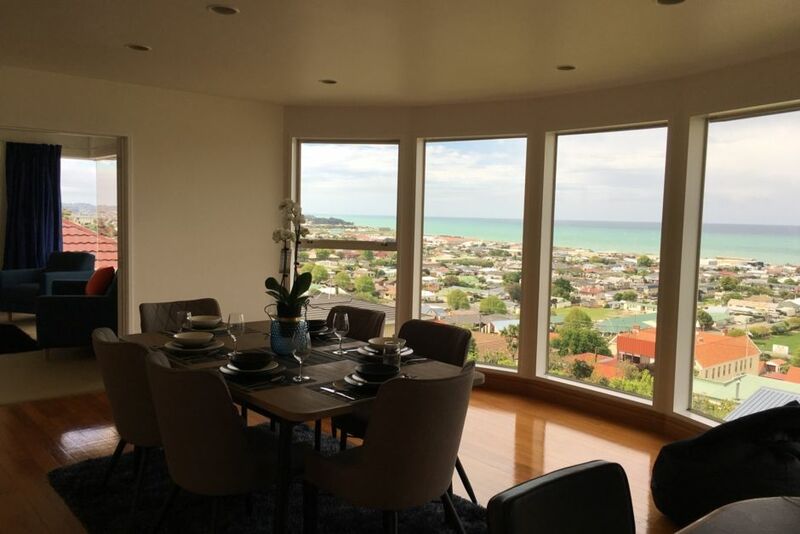 Beautiful home overlooking Oamaru's town and harbour, and out to the pacific ocean. Quiet street within walking distance of Oamaru's shops, thriving cafe and restaurant scene and New Zealand's steam punk capital. Nearby attractions include the penguin colony, mountain biking and the Alps to Ocean trail, Moeraki boulders and some of the best blue cod fishing to be found in New Zealand. Explore Oamaru's heritage area and lovely architecture, the steam punk children's playground, and local artisan products from its breweries, cheese factories and whiskey bar. 15 minutes drive from 'Dot's Castle' and Riverstone restaurant. Relax and rejuvenate in a quiet, stress free environment. Enjoy complimentary tea and coffee, eco-friendly bath and shower gels, 800 -1000 thread count Egyptian cotton bedding, quality furniture and appliances. Super King split beds are available in all rooms. Please advise what configuration you would like at least 1 week before arrival. . Ocean View from the living room, dining room and kitchen. Lovely house in a convenient but private location. Would stay again. Hilary's place is absolutely gorgeous! Hilary's place is absolutely gorgeous! You can see the whole Oamaru from the house including the harbour and the blue water. The house itself is clean, beautiful and well maintained - the photos just don't do it justice! Highly recommend to anyone who wants to have a memorable experience at Omaru. This proper has fantastic view of ocean as well as can see sunrise above sea level. This proper has fantastic view of ocean as well as can see sunrise above sea level. Fireplace works very efficiency. House is clean and tidy and kitchen has new and famous brand name equipment with more than you need kitchen utility. All beds is comfort and well setup. You want to sleep on at once when look at first sight. If all bed has heated mattress that will becoming perfect in winter season. Sure will come back to stay again soon. Fantastics views over Oamaru and everything we needed. Fantastics views over Oamaru and everything we needed. We are already planning to come back next year! Sensational house with amazing views. Sensational house with amazing views. Large bedrooms, and very spacious living areas make the house a pleasure to stay in (we were there, 3 housebound couples, during Cyclone Gita and didn’t feel cramped at all). Clean and well furnished property. Great location.